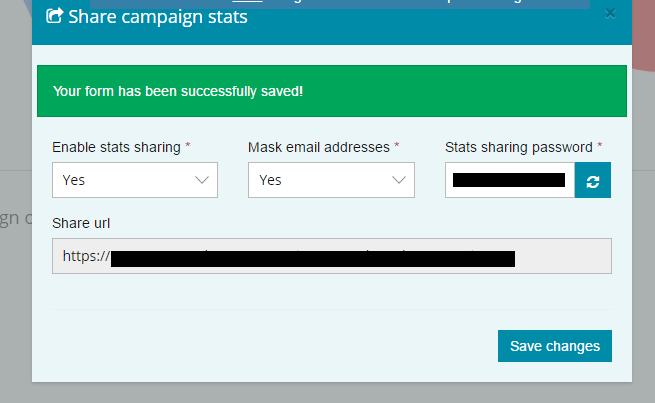 After you have successfully sent the email campaigns to your list of subscribers, you will get the report of the campaign and you can easily share these report with your teammates and managers. You can share these indepth reports with password protection too. To start sharing the reports, follow these steps. 4. On the next screen, near “campaign overview” you will get a option to “Share Campaign Stats”. 5. In the new modal window, choose the actions accordingly for “Enable stats sharing” and “Mask email addresses”. 6. Copy the “Share URL” and the “Password”, and share the URL and Password with end user. 7. Once the user will share the URL, the end user can click on the URL and check the stats.